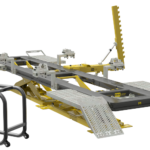 The UnoLiner W50 Manual Lift fixes a scissor lift to its bench frame. 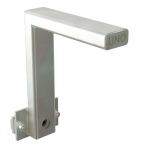 In combination with the W10 Bench Wheel Set, this bracket provides mobility for UnoLiner’s Drive-On and Roll-Over chassis straightening benches. 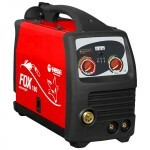 This makes moving the bench to another spot in the workshop fast and easy. 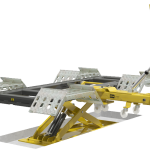 Transporting to another location also becomes an option with this combination, because a secured bench and lift can be loaded onto a truck. 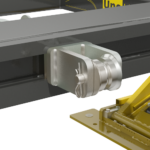 Applying the W50 is easy: place its hook around the lift’s axis, tighten one bolt, and you’re set to go. 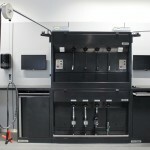 See the W20 Wheel set and W60 Manual Lift for our mobility solutions regarding In-Ground straightening bench systems.